In 1985, David Letterman called Atlanta Braves pitcher Terry Forster a “big fat tub of goo.” The left-hander, who stood 6’3”, reportedly weighed 270 pounds. Had the internet been around back then, Forster would have been all over it. As it was, the rotund putdown entered the lexicon, at least for a while. To his credit, Forster took Letterman’s comment for what it was, a joke. He appeared on Late Night with David Letterman and came out to the desk while eating a sandwich. A lot has changed over the years. Today’s baseball player is a lean, mean, ball-playing machine. The average weight of a player on the 25-man active roster is 210.66 pounds. The average weight of a player on the 40-man active roster is 208 pounds. The heaviest 25-man active roster belongs to the New York Yankees. The Bronx Blubbers 25 players weigh a total of 5,541 pounds. The Texas Rangers have the lightest active roster at a gossamer-like 5,090 pounds. The difference between the Yankees and the Rangers is 451 pounds. That works out to a difference of 18.04 pounds per player. Going by 40-man rosters, the Los Angeles Angels of Anaheim are Major League Baseball’s heaviest team. They weigh a combined 8,630 pounds with a large portion of that coming from their name. Besides the Angels, the other fat MLB teams are the Yankees, the Nationals, the Reds and the Dodgers. The world champion Chicago Cubs hold the title of lightest 40-man roster. Their team weighs 7,760 pounds. It’s light because their 40-man roster contains just 37 men. The St. Louis Cardinals have the lightest 40-man roster, that’s actually 40 men strong. The Cards weigh a combined 8,010 pounds or a tick over 4 tons. 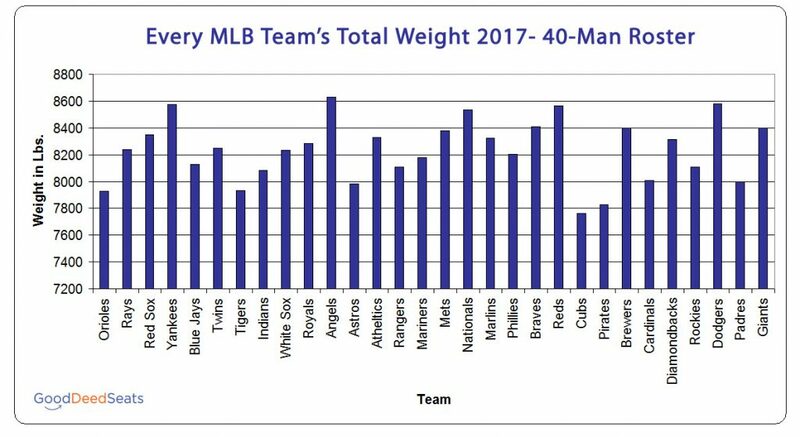 Since teams don’t need to have 40 men on their 40-man roster, below we are going to rank our Major League Baseball teams from fattest to lightest using the average weight of the players on their 25-man active roster. By the way, the heaviest player in the Majors is CC Sabathia. The 6’6” pitcher is the league’s only 300-pounder. The New York Yankees play in the Big Apple. Looking at their L-Bs, they might want to eat more apples. The Washington Nationals have six players over 230 pounds including Sammy Solis who weighs 250. The Los Angeles Angels of Anaheim may have the heaviest 40-man roster, but their 25-man active roster is only girthy enough for third place. The Atlanta Braves are a 100 to 1 long shot to win the 2017 World Series. They are lock, however, to eat all the doughnuts. 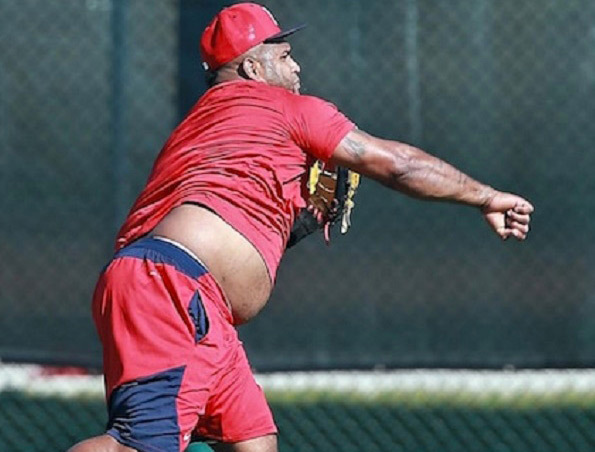 St. Louis Cardinals – 215 lbs. The good news is the St. Louis Cardinals have plenty of time to turn their slow start around. The bad news is they’re still hungry. Milwaukee Brewers – 214 lbs. Combine all the players on the Milwaukee Brewers active roster and you’ll get 5,350 pounds. Unfortunately for the Brew Crew, they are not paid by the pound—Brewers have the league’s lowest payroll ($63,038,148). Arizona Diamondbacks – 213.6 lbs. The Arizona Diamondbacks got off to a hot start. But at a combined 5,340 pounds, don’t ask their 25-man roster to step away from the buffet. Los Angeles Dodgers – 213.6 lbs. The Los Angeles Dodgers have the league’s highest payroll at $243,170,828. That means their 25-man active roster is getting paid $45,537.60 per pound. Chicago Cubs – 212.6 lbs. Pittsburgh Pirates – 212.08 lbs. Pitcher Juan Nicasio is the Pittsburgh Pirates’ heaviest player. Scales tell him that he’s 252 pounds. San Francisco Giants – 211.96 lbs. The combined weight of the San Francisco Giants 25-man active roster is 5,299 pounds or 84,784 baseballs. Houston Astros – 211.8 lbs. Houston Astros are anchored by 270-pound Evan Gattis and 250-pound Will Harris. New York Mets – 211.4 lbs. New York Mets, and the rest of the National League East, weigh a combined 26,651 pounds. Miami Marlins – 211 lbs. The Miami Marlins 25-man active roster weighs 5,275 pounds. Justin Bour is responsible for 265 of them. Oakland Athletics – 210.6 lbs. The Oakland Athletics have an even lighter 40-man roster. It averages just 208.25 pounds. Chicago White Sox – 209.6 lbs. The Chicago White Sox have two 255-pounders: Jose Abreu and Lucas Giolito. Cincinnati Reds – 209.24 lbs. Cincinnati Reds pitcher Sal Romano weighs 270 pounds. Of course, he’s 6’ 5”. Tampa Bay Rays – 209.12 lbs. The Tampa Bay Rays are light on the field and in the payroll department. They have the league’s second lowest team salary ($69,962,532). Kansas City Royals – 208.8 lbs. The Kansas City Royals 40-man roster weighs a total of 8,285 pounds. That’s an average of 207.125 per player. Boston Red Sox – 208.52 lbs. The Boston Red Sox are 328 pounds lighter than the Yankees. Philadelphia Phillies – 208.2 lbs. The Philadelphia Phillies lay claim to Elniery Garcia, Cesar Hernandez, and Roman Quinn. They weigh 155, 160, and 170 pounds respectively. Detroit Tigers – 207.8 lbs. The Detroit Tigers are one of four teams with a payroll over $200 million and one of nine teams with a combined weight under 5,200 pounds (5,195). Minnesota Twins – 207.6 lbs. Minnesota Twins were predicted to finish way out of the playoff race, but they started the season on a hot streak… and a light streak. The combined weight of their 25-man roster is just 5,190 pounds. Toronto Blue Jays – 207.4 lbs. In Canada, the average weight of the Toronto Blue Jays 25-man roster is 94.075058 kg. Baltimore Orioles – 207 lbs. The Baltimore Orioles are the lightest team in the American League East. That entire division weighs 26,276 pounds. Cleveland Indians – 205.68 lbs. The Cleveland Indians 40-man roster tips the scales at 8,082 pounds. That means the average weight of their roster is more than three pounds less than their 25-man active roster. San Diego Padres – 205.32 lbs. The San Diego Padres find themselves near the bottom of this list thanks to Carlos Asuaje. The 5’9” second baseman weighs a mere 158 pounds. Seattle Mariners – 204.6 lbs. With a 25-man roster weighing a combined 2.5575 tons, the Seattle Mariners are, pound-for-pound, the worst team in Major League Baseball. Colorado Rockies – 204.4 lbs. The Colorado Rockies don’t have rocks in their pockets. That’s especially true of Alexi Amarista and Raimel Tapia, both weigh 160 pounds. The Texas Rangers will get heavier. 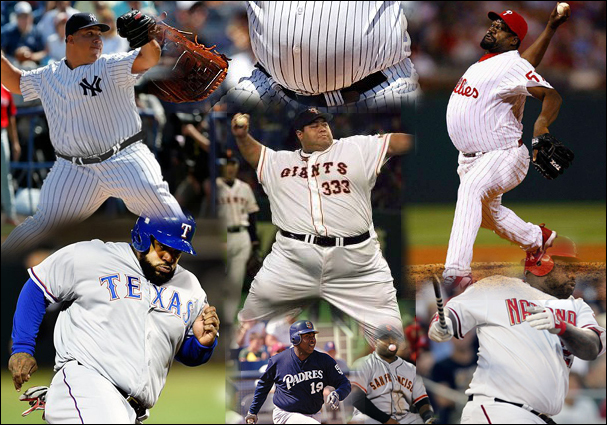 They currently have 1,335 pounds on the disabled list and that doesn’t include the 275-pound Prince Fielder. Note: All player weights were taken from Baseball Reference and MLB.com and are current as of 4-12-2017. Both 40-man and 25-man active rosters are subject to change.